No records remain of the machine Johann Gutenberg used to print the first books with moveable type. The question of what this press and other early presses were like has occupied the minds of generations of historians. It can never be definitively answered. The person who has probably come closest to a reasonable reconstruction of a very early press is Alan May, a man who has both the knowledge of a print historian and the technical skills of a craftsman. Alan used these abilities to acclaimed effect in 2008 when a television production company gave him the chance to construct a press to print a facsimile page from Gutenberg’s 42-line Bible of the 1450s. The process of research, design and construction of the press was a key feature of The machine that made us, the resulting documentary presented by Stephen Fry. Following from the construction of this press and from a well-known sketch of a printing press made, probably from memory, by the artist Albrecht Dürer in 1511, Alan made a number of observations about the way presses probably developed from the very first examples. When the Dürer Press Group commissioned a new working press from Alan in 2014, his insights led to a machine that can either be used as a ‘one-pull’ press, as we believe Gutenberg’s was, or as a ‘two-pull’ press. The two-pull configuration is shown in Dürer’s sketch and gives greater output by allowing two pages of a book to be printed without taking the paper out of the press and putting it back in again. It is probable that older, one-pull, presses were modified in this way to give the printer a considerable boost from a machine that would be costly to replace. 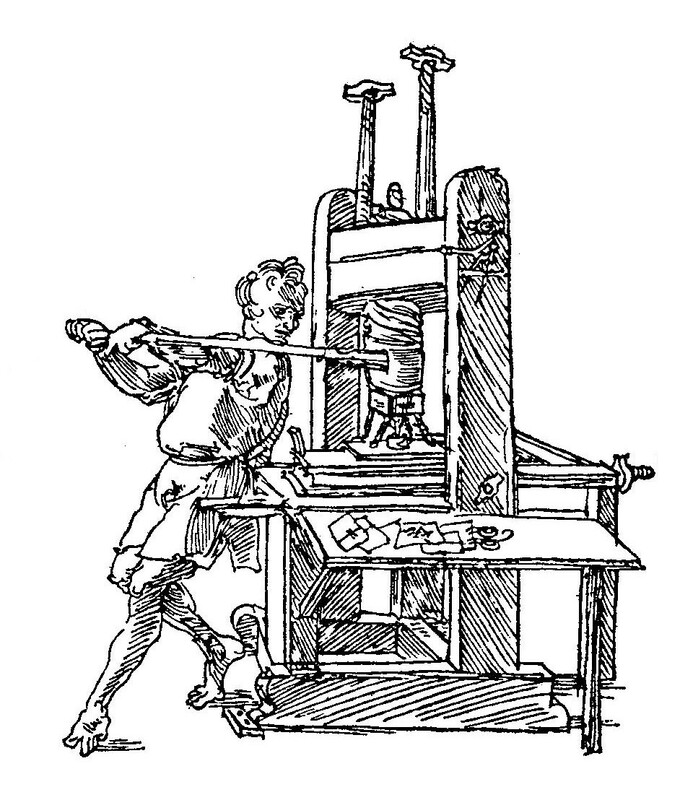 The new reconstructed press is made so that it both copies Dürer's illustration and can also easily be converted to a one-pull press, as hinted at in Dürer's sketch. Thus it can become its earlier incarnation. This should prove valuable in researching the development of the wooden press, as well as giving users the opportunity of working on both a one-pull and a two-pull press. St Bride Foundation in Fleet Street has provided a home for this brand new press in their established Print Workshop, and it was installed on 8 October 2014, and formally unveiled/launched at St Bride Foundation, Bride Lane, Fleet Street on 12 November 2014. Since then it has been in use on a number of occasions, even once by HRH The Prince of Wales. The Dürer Press Group want the press to be seen and operated by as many people as possible, giving a taste of the first European information revolution and helping the understanding of the nature of printing and the investment in time, money, materials and human ingenuity it represented. Housed in the St Bride Print Workshop, the new press helps further the Foundation’s charitable commitment to education. The press is demonstrated on workshop open days organised by St Bride Foundation, and is also available for private demonstration. 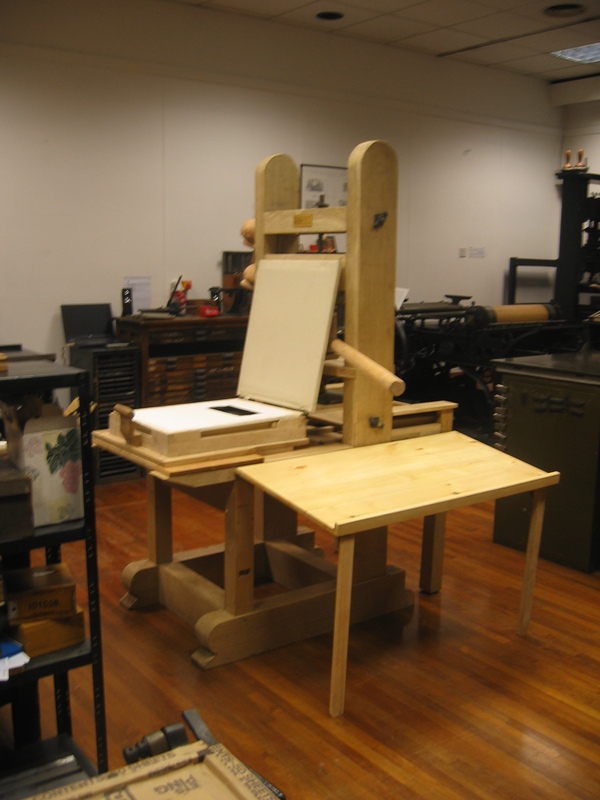 A series of one day workshops is available for groups of 3 or more people, on 12 June, 24 July, 11 September and 9 October in 2015, when you can learn the basics of printing skills including book planning, setting type, imposition, inking, feeding and operating the press, and binding printed sheets in the way renaissance printers would have done. A range of other courses also takes place at St Bride, and more details are available from St Bride Foundation. In addition, the press can be made available for hire and location work subject to availability. Contact the Dürer Press Group for information.